16th-century German blind-stamped pigskin over wooden boards. 474 leaves of 477; wanting the blank fols. 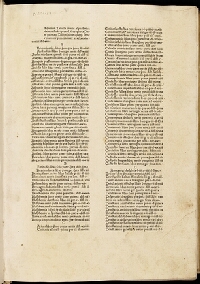 1, 5, and 477, unfoliated and unsigned; without colophon; some marginalia in a contemporary hand. 1. Franciscan Canons in Polling (1744). 2. Herschel V. Jones. 3. Eric Sexton, Christie's 1981, lot 164.